However with Lincoln’s election in 1860 – Old Abe being from the school of Hamiltonian thought – and the secession of the Jeffersonian South, the Republican Party re-instituted all of Hamilton’s ideas – a strong central government, a national banking system, fiat currency, high tariffs and internal taxes, direct aid to corporations, loose construction of the Constitution, and suppression of civil liberties, with little opposition. In short, the war destroyed the Age of Jefferson; the Hamiltonians had won the argument. The Party of Lincoln, the ideological heirs to Hamilton, controlled the White House for the next 24 years, and the ensuing quarter century of corruption, profligate spending, high taxes, and ever-expanding government was the norm. The tide finally turned in 1884 when Grover Cleveland came into office and gave the nation a strong dose of old-fashioned, Jeffersonian values. Four years of Cleveland Conservatism resulted in a rollback of Hamiltonian programs, producing a more honest government, an end to presidential luxury, a slashing of the bureaucracy, a halt to out-of-control spending, the protection of the massive budget surplus, and a reduction of the national debt by 20 percent. Cleveland’s second term, from 1893 to 1897, saw the nation suffer under a horrendous economic depression, a calamity known as the Panic of 1893. Members of both parties sought to use government to help correct the ravages of the downturn. 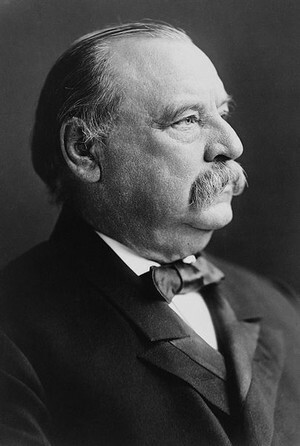 Yet President Cleveland would not allow the implementation of any federal stimulus programs. There were no bailouts, no “shovel ready jobs,” no tax hikes, and no unemployment benefits. Instead, the Cleveland Administration ended inflation, cut taxes and tariffs, and reduced spending. With Jeffersonian principles, the depression ended within three years. Today we find ourselves in an almost identical situation. The ideas of Hamilton have taken a firm hold in Washington, and as a result, the nation is in a steady state of decline. We need a new Grover Cleveland to instill the nation with the old ideals first espoused by the Jeffersonians. My new book, The Last Jeffersonian: Grover Cleveland and the Path to Restoring the Republic, examines our current predicament through the prism of history and offers answers that will put us back on the path set forth by our Founding Fathers. [i] Governor Richard Yates, Final Message to the Illinois General Assembly, January 2, 1865, Chicago Tribune, January 5, 1865, as quoted in Jeffrey Rogers Hummel, Emancipating Slaves, Enslaving Free Men: A History of the American Civil War (Chicago: Open Court Publishing Company, 1996), 332. [ii] George Ticknor, as quoted in Morton Keller, Affairs of State: Public Life in Late Nineteenth Century America (Cambridge, Massachusetts: Belknap Press, 1977), 2. This entry was posted in Economics, History, Jeffersonian Thought and tagged america, conservatism, democrat, founding fathers, gop, Hamiltonian, jeffersonian, libertarianism, paternalism, republican. Bookmark the permalink.